For the past two decades, governments have been heralding the importance of proficiency in STEM subjects because of their link to a country’s technological innovation and economic development. The calls for a focus on STEM education to prepare our graduates for an increasingly technological and rapidly changing world have been loud and persistent. This has resulted in what Sanders (2009) calls STEMmania, with a large proportion of educational research and practice funding dedicated to developing STEM policy and programs in higher education. The persistently low numbers of women entering (and staying in) STEM professions has become known as the “STEM pipeline” problem. The recent announcement that Dr. Donna Strickland from the University of Waterloo won the Nobel physics prize has catapulted the discussion of women in STEM into the spotlight once again. 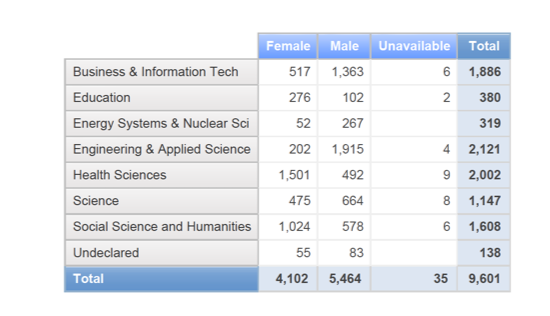 The majority of university graduates are women, yet there is a gender gap when it comes to STEM graduates. That gap is wider in physics, computer science and engineering, than in biology, math or chemistry (Cheryan, Ziegler, Montoya & Jiang, 2017). Our 2018 enrollment figures at UOIT reflect this trend. In Canada, women earn one in five engineering and one in four computer science undergraduate degrees (Caranci, Judge & Kobelak, 2017). Governments are taking notice of this problem, including Canada’s Minister of Science, Kirstie Duncan, who announced in June 2018, a “made-in-Canada” approach to promoting equity, diversity and inclusion in STEM at Canadian educational institutions, known as the Athena SWAN initiative. The Athena SWAN charter was established in the UK in 2005 to help foster the advancement of careers for women in the STEM fields, but in 2015 it was expanded to include work undertaken to address gender equity more broadly, in all academic subject areas, for academics, professional and support staff, and trans staff and students. According to research, the gender gap in STEM is not the result of women’s ability in these fields, but rather persistent masculine stereotypes that girls and women use to shape their perceptions of careers in STEM. Cheryan et al. (2017) identify “masculine culture” as a key reason that women are discouraged from going into STEM. This is compounded by a “confidence gap” for women, who demonstrated less interest in their STEM courses when their instructor was male. As Cheryan et al. (2017) conclude, “subcultures” that make girls and women feel like they belong, need to be developed to counteract these erroneous perceptions. Students and emerging women researchers need mentorship through the various career milestones. In Canada 28% of full professors are women; at UOIT that number is 15%. Underrepresented minorities and female students are greatly underrepresented in the STEM field and this is a cause for concern. When a workplace lacks diversity, the organization sacrifices the many benefits that cultural diversity provides, including the provision of suitable mentorship. Students and emerging scholars interested in a STEM profession need to see that there are individuals like them, already succeeding in that field.